See the best of Tokyo on an open-top double decker bus while savoring a delicious European-style semi-course meal. Enjoy the luxurious experience while taking in the panoramic views of the city during the day or at night. 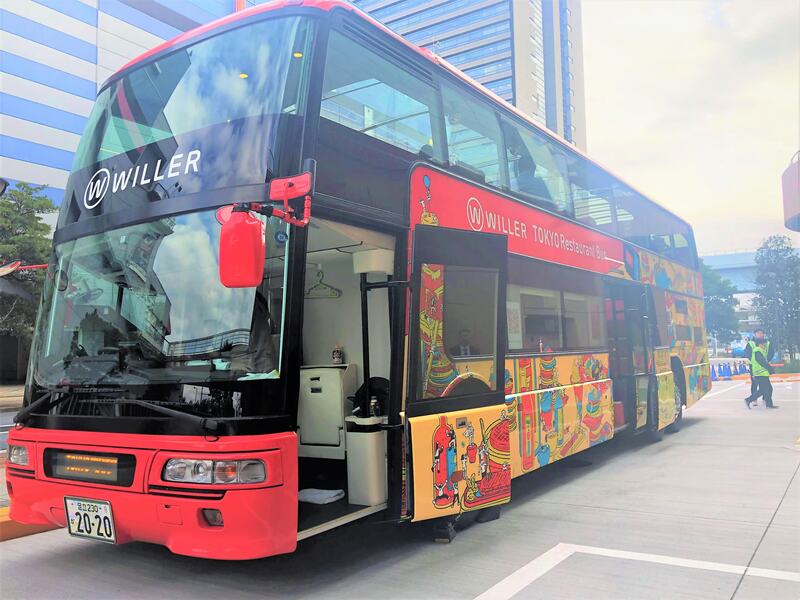 Step aboard on this luxurious restaurant bus to have a unique dining experience while driving by Tokyo's best sites. For solo participants, please select the 2-3 person plan. Dine on Restaurant Bus Tokyo! Please note that the content in the menu is subject to change. Take your time as you indulge each dish while gazing at the exquisite scenery of Tokyo and savoring assorted western-style cuisine. - Connected to Hibiya station on the Tokyo Metro Chiyoda Line, Hibiya Line, and the Toei Mita Line. - 4-minute walk from Yurakucho Station on the Tokyo Metro Yurakucho Line. - 5-minute walk from Ginza Station on the Tokyo Metro Marunouchi Line, Hibiya Line, and Ginza Line. - 5-minute walk from Yurakucho Station on the JR Yamanote Line or JR Keihin Tohoku Line. 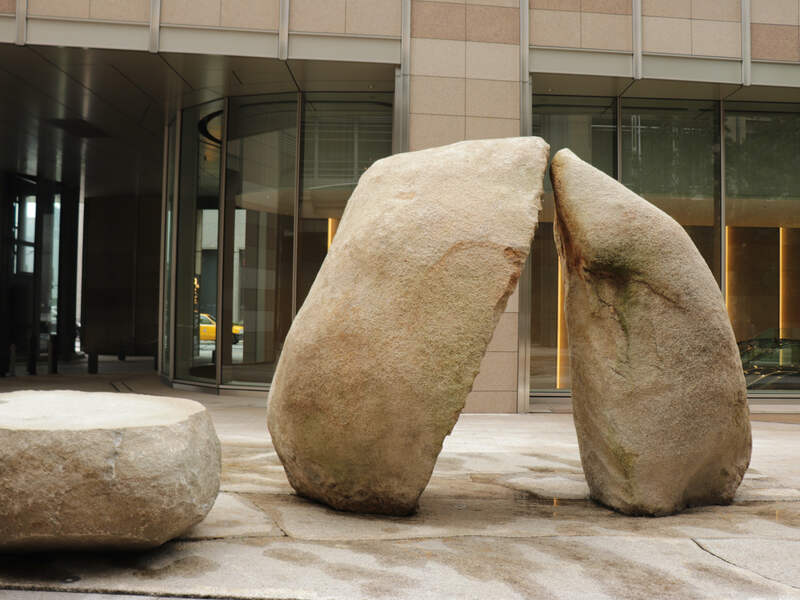 Check-in location is near Hibiya-dori by the Hibiya Step Plaza. Please meet around the statue shown in the photo. The bus will be parked near the meeting point. You can book a minimum of 2 and maximum of 4. If you are a solo participant, you may be placed at a table for two or three. Please note that seats cannot be selected in advance. Please understand that in order to seat everyone comfortably, you may not be able to get your requested seat. Drinks (soft drinks and alcohol) will be available for purchase on board. Please understand that this activity cannot accommodate specific food allergies or restrictions. If you wish to bring your own food or drinks, each item will require JPY 3,000. Except for Aqua City, all stops will be seen from your bus window. You may be asked to share a table with other participants. If you are booking as a group of five or more, your group will be separated. Participants of two-person bookings will be seated beside each other. If you are attending by yourself, please sit in the one-person seat. 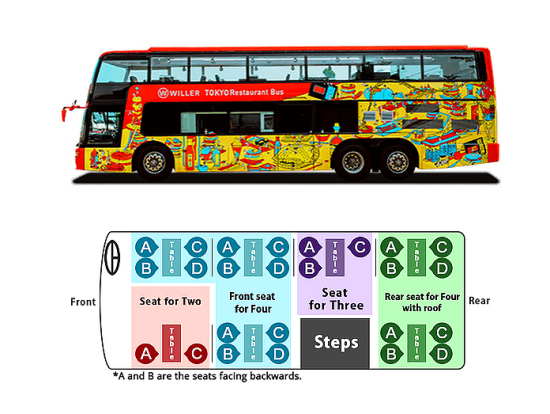 Seats will be on the second floor of the open top bus. Please note that the table for four in the back of the bus has a roof that cannot be opened. For groups of five or more and for those who wish to book a private experience, please contact VELTRA through your account. Any cancellations made between 23:59 local time, 11 business days to 23:59 local time, 8 business days prior to the activity will be subject to a charge of 20% of the total amount. Any cancellations made between 23:59 local time, 8 business days to 23:59 local time, 2 business days prior to the activity will be subject to a charge of 30% of the total amount. Any cancellations made between 23:59 local time, 2 business days to 23:59 local time, 1 business days prior to the activity will be subject to a charge of 40% of the total amount. Any cancellations made between 23:59 local time, 1 business days to 1 hours prior to the activity start time will be subject to a charge of 50% of the total amount.